During the summer when my strawberries were at their most abundant at my plot, I had made some strawberry curd. After all you can get blueberry curd, banana curd and even cranberry curd. I was so pleased with my strawberry curd. I carefully poured it into a jar and stored it away in a dark place. Then one weekend, I decided we could have the strawberry curd with some home-made waffles, I opened the jar only to find a blue skin had formed on top of the surface, so it had to be disposed. I don’t know if I did something wrong, or should have put a waxed disc over it, but whatever I did wrong, put a dent in my confidence especially as I was still new to preserving, especially with curds. Anyway, couple of weeks ago whilst catching up with fellow bloggers blogs, I saw Nora the Splorer’s lush looking Clementine curd, and it encouraged me to try again, especially as I have a fruit bowl full of clementines. I am so glad I did. Making this curd has given me the confidence to perhaps try making a Cranberry curd and even Clementine Marmalade, as I am not too keen on the 'tart' sharpness of the orange ones. Oh so how does, the Clementine curd taste? Well I can let you know with all honestly as I tried it this morning with some home-made cranberry waffles. The Clementine curd is sweet, sharp and refreshing. I think much nicer than lemon curd. I have decided to contribute these dishes towards a monthly food blogging challenge called “In The Bag”. Every month food blogger Julia of A Slice of Cherry Pie alternately hosts with Scott of the Real Epicurean to come up a recipe using seasonal ingredients. The seasonal ingredient in the bag for December were: Cranberries, Clementines and Nuts. Goodness it has been a long while since I last submitted to In the Bag, my last submission was in March last year with my Welsh Glamorgan Pakora’s based on the famous Glamorgan sausages; and the ingredients in the bag at the time contained leeks, which I had growing in abundance at my allotment plot. This time though I thought I would make some cranberry waffles made with cranberries imported from Canada and the USA; and the clementine curd. Now I can't decide between to two which to submit. So I plucked for simplicity and went for the Cranberry waffles. Enjoy. Please don't laugh at my writing, I know it looks like a six year old has written it, but you try writing once the label has been stuck to the jar. 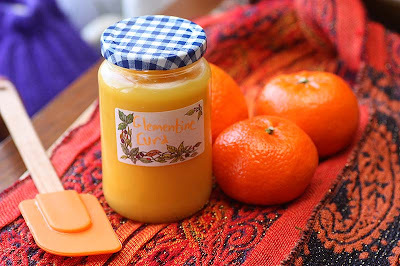 Oh and i haven't forgotten the Clementine curd recipe. You can find a number of Clementine curd recipes on the Internet, but below is the recipe I used. You can double the quantities of the ingredients to make 2 x 450g jars, but I decided to only made one this time. In a large bowl, add the zest and the juice of the fruits into a bowl with the sugar, eggs and yolks and mix well to combine. Pour into a large pan. Add the butter and place over a very low heat. Cook, constantly stirring with a wooden spoon, until the curd is thick and coats the back of a spoon, up to 45 minutes. Pour into a sterilised jar and seal. Allow to cool and refrigerate. Use within two weeks. I completely symapthize with how hard it is to write on a jar! 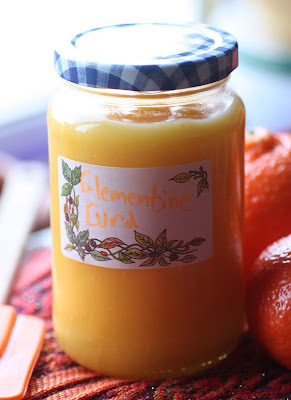 :-) Your clementine curd looks incredible - I'm so impressed!! I love the idea of cranberry waffles, too - I'm definitely printing out the recipe for brunch next weekend! :-) Thank you for the fabulous recipe! My husband is far less sympathetic and keeps laughing out loud at how poor my handwriting looks. Oh well. Maybe I will print labels next time. I hope you enjoy the waffles when you make them. I've tried the basic waffle recipe many times, so know it is reliable. Enjoy! Ooooh waw, clementine curd: home made!! I am so impresed!! 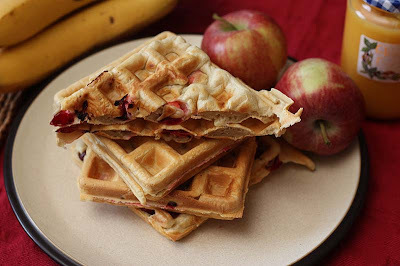 Your cranberry waffles look divine as well! I so love this delicious combination!! Superb lovelyness!!!! A must try for next weekend! Wonderful post! We will be trying this as soon as the holiday stuff settles down. DocChuck and wife, Doctor E.
:D I love the way that clementine curd is doing the rounds - from Chocolate Teapot to me to you! And it's such a good idea - so simple and seasonal and delicious. And the waffles look scrumptious - I need to get me a waffle maker!! oh I was just thinking how gorgeous your label looked and I then I see you apologising for it - no need!!! Your waffles look very yummy! so does the curd, its such a shame curd cant be made without eggs because it looks so delicious. Yum! Looks lovely, and such a nice pic on tastespotting! The curd looks great! And the waffles looks delicious as well! OH MY...your Clementine Curd sounds fabulous! Never tried fruit in my waffles before but it's now on my ToDo List! 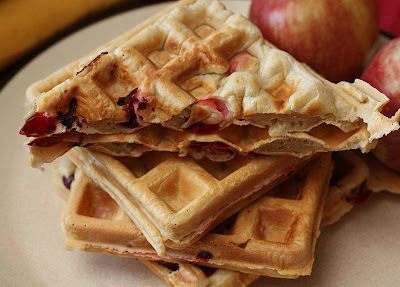 These cranberry waffles look absolutely yummy and the clementine curd sounds so good. I think your handwriting on the jar looks lovely, I liked it, it gives the feeling of homemade, YUM! Thank you so much Sophie. I hope you enjoy! Thank you and Welcome DocChuck and Doctor E. It is a pleasure to make your acquaintance. Thank you Nora. I would thoroughly recommend getting a waffle maker. I don't think this curd is that eggy, so would recommend it for sure. Its one of the things I love about blogging, how other bloggers share recipes they've seen in magazines and cookbooks that some of us would not get round to checking out. 1.In a saucepan, whisk together water, sugar, cornstarch, and salt until cornstarch is dissolved. 2.Bring mixture to a boil over medium-high heat, stirring constantly. When mixture thickens. 3.Reduce heat to low and cook for another minute, stirring constantly. 4.Pour mixture into a non-metallic bowl and add lemon juice and zest, mixing well. 5.Allow to cool and thicken at room temperature. 6.Can be refrigerated, covered, for several days. Before serving, beat thoroughly to a smooth, spreadable consistency. It's so lovely to hear from you Winnie. Welcome Peggy, so nice to meet you. Thanks Michelle. If you like the fresh cranberries, you must try fresh blueberries! Thanks for being kind about my handwriting Oraphan. Thank you Jade. Its so nice to have you over. Its nearly all gone, we've been having it for breakfast every weekend. When I am googling recipe ideas I rarely leave comments upon the sites I end up on....but these were just too good. Filling and tart and delicious, I loved them...and ate one too many! Thanks for getting what was in my head onto my plate. I'll have to check out the rest of your recipes! I must thank you then for your lovely comment on my humble little blog space. It was truly most appreciated and I enjoyed reading it too.